These days, people asking for your WiFi password has become almost a standard in everyone's house whenever guests come visit. Whether for education, entertainment, getting in touch with family and friends, and even socializing, a solid and reliable Internet connection is no longer a luxury; it has become an indispensable necessity. With need comes innovation. Fibr, Home’s most powerful broadband, allows you to seamlessly and simultaneously experience the browsing of multiple websites, streaming hundreds blockbuster movies on-demand from Clickplay, and watching Cignal Digital TV Channels. I am particularly partial to this commercial because the girl is one of my classmates and close friends in college. Folks, you know how obsessed how big of a fan I am of Suzanne Collins's The Hunger Games trilogy, yes? Well, I also have a big imagination. With just ten days before Catching Fire is shown, how about we imagine for a moment that I am one of the victors reaped for the 75th Hunger Games? What do you think will happen? Do you think I will drop dead the moment the cannon is fired? Hmn, I don't know about that, because I know I won't go down without a fight. Here's what I think. 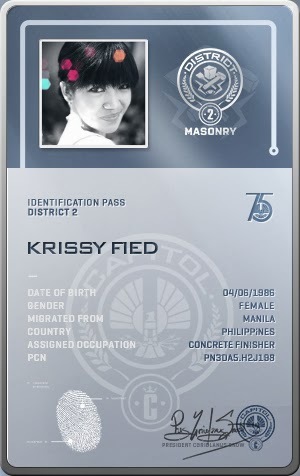 In my fictional version of Panem, I came from District 2, the district specializing in masonry, weapon-making, and training the Capitol's army of Peacekeepers. Despite my small frame, having a lot of experience as a concrete finisher ensured I am more physically able than I look. I didn't need to work ever since I was crowned a victor during my year but I wanted to remain fit and strong - keep the machine well-oiled, so to speak. That, and coming from one of the wealthier districts with a dependable Fibr connection will give me a distinct advantage over the other returning victors. Give me an advantage how? For one, Youtube is a treasure trove of fitness videos so I'm sure I'll have a grand time choosing which training to undergo for the day every day until we go to the arena, together with an accompanying playlist. With Fibr, I can readily stream in Clickplay whole "seasons" of the other returning victors' respective turns in the arena to re-watch how they won and see what their specific strengths and strategies were. I can also download videos of their past interviews and victory tours to note what they like, what makes them tick, and have a general idea what their attitudes towards the Games are. After all, knowing is half the battle. Being a Career, the other tributes are predisposed to stay out of my way, but I have a personality that can easily adapt to other people and talk coax information from them. Like a television show from Panem's olden days (when it was still called North America) named Survivor that I was able to see when Cignal featured throwback shows, the Hunger Games is a social game; it is easier to build alliances and take out the weaker ones first before we'd have to turn on one another. Since the Hunger Games is staged each year for the entertainment of the Capitol and my survival would most likely depend on sponsors, I will need to develop my personality and win the audience's hearts. To do this, I need to brush up on what's current and what's hot in the rumor mill, maybe even memorize a popular movie quote or two. Thankfully, Fibr allows me to open and run several tabs at once, ensuring I won't have any wasted idle time waiting for pages to load. I am also very smart and ready to do all the research and studying I can so I know that unlike Foxface from the 74th Hunger Games, I won't be fooled by some poisonous berries. Berries. Tsss. With my skills, strength, and Fibr, I am ready to be crowned a victor for the second time. Let the third Quarter Quell begin! Fibr is available now in over 800-fiber powered villages nationwide. Visit www.pldthome.com or call 101-FIBR (3427) for more details.